In the previous post about shore support, I talked a little bit about the crew, particularly on the Peep Hen trips. The role of those crew on board the Peep Hen, SERENITY, and during the initial launch of AUKLET in 2012, was broader than the ordinary crew definition. It deserves further explanation. Folks have asked me, over time, about equipment and whatnot for making these boats accessible related to mobility issues. And there is a whole post about that coming. But the biggest, most important part of working out accessible sailing, for me, has been having help along the way. Folks who came to “crew” did so with the understanding that they would be involved in both boat handling and in helping me with tasks that were somewhere along the spectrum of “personal assistance.” Mostly this came down to passing a lot of stuff back and forth, and taking care of anything and everything that involved lifting, or tasks requiring strength that was out of my range, and anything to do with getting off the boat. During the process of figuring out how to manage each of these boats, that dual role was a big job! It’s one of the reasons for the steady rotation of crew on board SERENITY, because as it turned out it was also a tiring job. 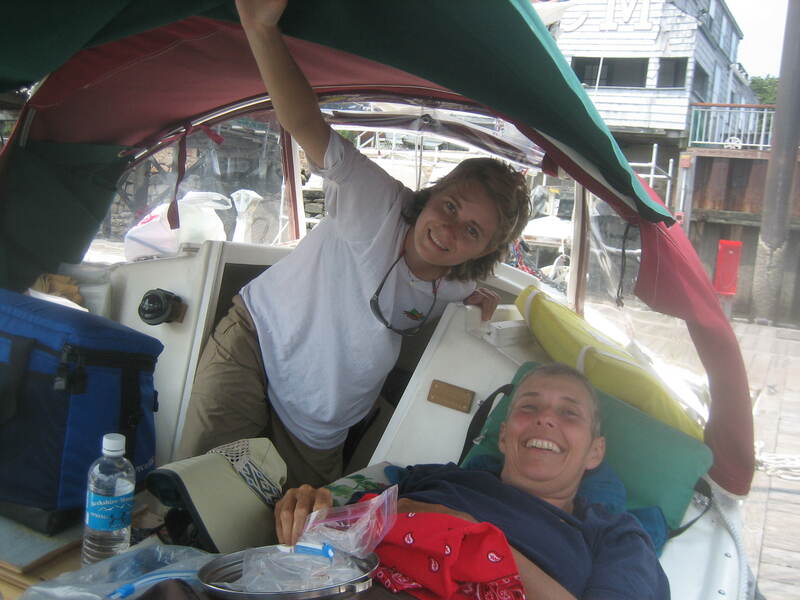 As the boat became gradually more organized and outfitted for what we were doing, things became easier, and the last person to crew on that boat with me in 2009 said “what, this is hard?” But the interesting thing is, that same person – thank you Michele! – came with me for the first five days after we launched AUKLET. Which was again a big job, and at the end of it, when Suzanne came to give her a ride back to Holyoke, Michele too was seriously tired. So was I, but as the instigator for all of this, it’s not quite the same! A couple of different things made being “assistive crew” in this particular setting a hard job. For starters, getting a boat organized for comfortable cruising is a substantial project anyway, and in some ways it’s a bigger project on a smaller boat, because everything has to be just so in order for it all to fit in such a constrained space. The Peep Hen is 14 feet long. It’s a miracle of microcruiser design, but still a small space for two adults and gear for a few weeks. I was set up for sleeping in the cockpit, and crew had the bigger berth in the cabin, but this all involved morning and evening rearranging. Head systems were tried, rejected, or adapted again. Cockpit covering for rain, and insects, involved a long process of refinement, and on and on. We did a lot in the driveway, but that only gets you so far. While all that on-water development was proceeding, the most common feedback that I got was that it would have been better to have two crew, one for boat handling, and one for “personal assistance.” Most often, folks didn’t care which role they were in, but found it challenging to move back and forth between the two. Some folks didn’t care about the roles issue, but didn’t want to be solely responsible for the muscle side of both sailing and boat well-being, as well as what they saw as being responsible for my well-being. I think that this was more challenging because where I live is not a big sailing area, and as it turned out, the folks I had rustled up almost never had any sailing experience at all. So there was a lot of learning going on about basic sailing, on the part of the crew, and a lot of learning going on for all of us about how to best arrange the boat for both living and sailing. And I was learning how to sail that particular boat, which was new to me. On top of all this, we were going cruising! And with a very minimal auxiliary motor, no less. In hindsight, I can see what an incredibly tall order all of this was. The miracle is the amount of fun that we had regardless. In total, about a dozen different women came sailing with me on SERENITY, in five separate trips that overall totaled 63 days, including overnights. We went everywhere from the Connecticut River across the street from where I live, to the lower Connecticut River and over to Narragansett Bay, and on a separate trip, from the North Shore of Boston to Kittery, Maine, on the border with New Hampshire. Some crew came for more than one stint! Some came partly because it was a paid gig, and some came just for fun – or out of friendship, when they ordinarily were not knocking the doors down to go sleep in a tiny sailboat. The entire undertaking was a miracle of generosity and spirit of adventure, and looking back, I am utterly floored that it happened at all. Nowadays, since the end of that initial five days with Michele after AUKLET’s first launch, I have primarily been on the boat by myself. Here and there Suzanne has stayed overnight, and a few different folks have come sailing with me, entirely for fun. It’s been relaxing to sail alone, and to have crew whose role is simply sailboat crew. But it never could have gotten to this stage without the enormous generosity of all those folks who came sailing with me before, when it was unclear exactly how the whole venture was going to work in the first place. It would be incomplete to leave out the people dynamics that went with all of the above. I did those trips with folks I had known for years, and with folks I had only just met. Almost always, we had a perfectly fine time, and a good bit of fun. Some of us became much closer, as a result of spending that time together, and our friendships now are deepened by that shared experience. Some have drifted off – which often happens with “assistant” relationships, as people leave the area and move on in their lives. One old friend and I attempted a plan of sailing together on the Peep Hen for a month. In the end, after two weeks I said that I could not do that together anymore, feeling that the level of conflict was more than I was up for. In hindsight, it has become clear to me that for one thing, the boat was not yet organized enough to undertake such a long single-crew stint. The strains of the disorganization added to the inevitable strains of being in such close quarters for such a long time, and from my perspective our ability to manage those strains in a good, livable manner was exceeded. We had been fine in two previous short-duration sails, of a few days, but not so much, when it came to weeks. Further, from the broader perspective, sailboat crew/skipper relations are always a thing that might or might not work. Sailing stories are filled with incidents of crew joining and leaving a particular boat, sometimes because the crew leaves at the first available opportunity, or later, after a particular event, and sometimes because they leave at the request of the skipper. Boat compatibility, especially over time, is a miracle involving a whole bunch of varied dynamics. Overall, I remain enormously thankful to everybody who came on board the Peep Hen as “assistive crew,” and made all of that sailing possible. It’s pretty amazing that it worked at all, and truly amazing that so much of it worked so well! That it led to the kind of sailing that has filled this blog is an extra special gift. My heartfelt thanks go to each one of those adventurous women. As I see it, your problem was in using human crew. Nothing repels boarders better than a ‘Snake Onboard” sign. Not too good as a heat source on cold nights though. how about a Newfoundland? with a harness it would make an excellent source of propulsion. Every night will be a “one dog night” no matter what the temperature.. May put heavy strain on your composting toilet. Good strategies, all. This is the puzzle, after all – as a person who is comfortable sailing primarily alone for months and months, how does one find the comfortable niche for crew?? Just like with disability in general, unusual situations present fantastic opportunities, and we had some good fun. I’m afraid that my ambivalence related to crew has shown through in that post, and undoubtedly to the folks who actually came to join me on the boat. Some people need a LOT of time alone, and have people skills that are a bit labored. That the universe said “okay, you can go sailing IF you bring somebody with you at all times,” was grand, on the scale of cosmic opportunities! All the more reason to profusely thank the people who ventured forth, to share sailing on that tiny boat with me. Brave, and generous. PS the image of a Newfoundland dog on a Peep Hen – along with three weeks of cruising gear – is best of all!